Long ago, I remember reading an article saying that sense of nostalgia increases in proportional to aging. I have been living in Tokyo for over a decade. Tokyo is the city I have lived the longest in my life now and if ‘hometown’ is the place where you’ve lived the longest, I am living in my hometown and I should be feeling less nostalgia. Still, I sometimes feel like escaping from the busy city into a quieter place, soak myself in nature peace. If I were to concretize my mind of nostalgia, I would give the image of either Nara or Kyoto, where I spent most of my time in Japan, next to Tokyo. Here, I would like to write about some of the places that takes more than 2 hours drive from Tokyo. Introductions of places and things that I cannot stop to write because of nostalgia….. It was on my New Year holiday when an indelible scene of my childhood recalled while watching TV. My eyes were locked onto a TV commercial by JR Tokai, one of the major railway company, introducing their promotion on Nara, ‘Umashi Uruwashi Nara‘, a campaign they have been holding since 2006. 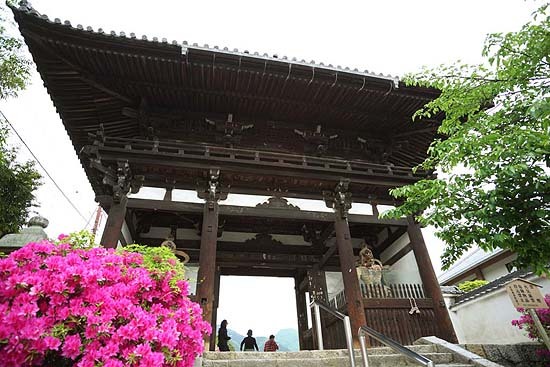 Like the former promotions of the places and temples of Nara, this term’s promotion on one of the temple in a small town of Taima-cho, Katsuragi-shi in Nara prefecture is nothing but beautiful. The featured temple, ‘Taima-deraW’ shown in the video and the poster deliver the atmosphere of the actual temple itself, the most maybe, that I could not believe my eyes at my first sight as the temple is not as famous nor big as the former temples in the series and most of all, because the temple is very well-acquainted with my father’s family. The gate of Taima-dera. Photo by (c)Tomo.Yun. I haven’t been there for quite a while but could remember the times I had visiting there with my family on certain occasions. Or memories of taking a walk there alone whenever I wanted to rely on something, not human. I wasn’t interested, nor knew nothing about Buddhism then but knew in my unconscious mind that the place has been there to give help and peace of mind to the people who needs them. The temple is not large, in fact it is compact, a size which I feel the right to calm myself down in front of the Sacred without hesitating from strong solemnity that I feel in some larger temples. No wonder the temple here gives comfort the most because unlike many other old temples, Taima-dera has long been supported by the devotions of the local followers after losing support of a strong clan as Taima family no later than in 15th century. 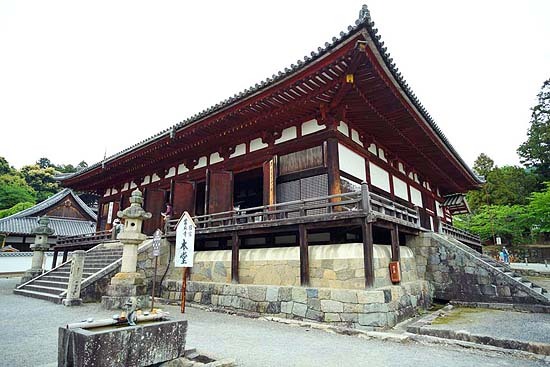 The main building, ‘hondo’, of Taima-dera. Photo by (c)Tomo.Yun. If you are in Tokyo or in Kanto regionW now and have watched Japanese TV, maybe you have seen the TV commercial of JR Tokai, featuring Taima-dera in Nara or may have seen the posters of the same series in railway stations. If you haven’t seen it, you can have a look from the link below. The Taima-dera displayed in the VTR looks old, imposing, sacred and mysterious maybe more because the narration in Japanese to it points out some mysteries that have long been interests to the archaeologists. One of the mysteries is the foundation of SukhavatiW, a land of ultimate bliss, on this land. Taima-dera is located in the north-west of Asuka where capital had been in Asuka periodW. Asuka was the centre of Japan for 100 years, before capital moved to where Nara city is now, 180 years before the capital was set in Kyoto. Buddhism was brought to Asuka from BaekjeW in 538 which was spread by the most powerful clan, Soga no UmakoW, became the other major religion in the Imperial Court in the era of Prince ShotokuW. Spreading Buddhism by clans at that time was related to building Buddhist temples as displays of religious piety as well as displays of funding ability. It was important for them to choose the right places for building their temples as they ought to have special meanings. Many were built in places that were thought to be sacred at that time, sacred in means of ShintoW or predecessor belief of what later became ShugendoW. 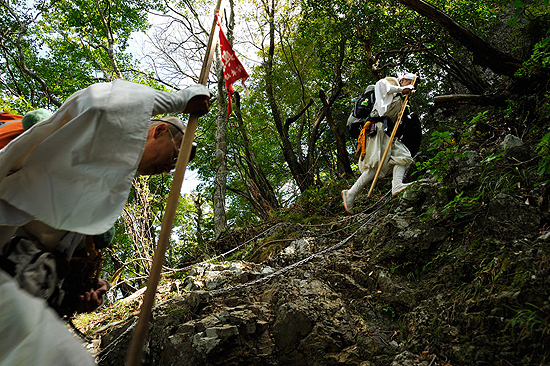 Shugendo practitioners today walking through steep surface of the sacred Mount Oomine. Photo by ‘banriman‘. The capital of Asuka was located on the small part of the basin with mountains of Yoshino and Mount Katsuragi that divides Nara and Osaka prefecture on the west side with Yamato SanzanW, the three sacred mountains, in the north. 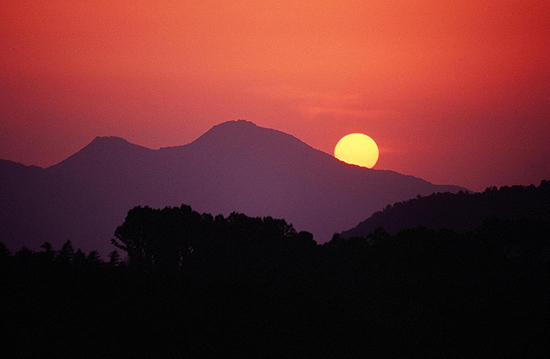 It was said that when the belief of Buddhism became the major religion, the ideology of after-world was more distinct, thought to be in the west, probably tied onto the Shinto idea of where the sun sets. Looking far west from where capital of Asuka was, you can find the mountain chain’s end, a mountain that looks like Bactrian camelW with two humps on its’ back, Mount Nijo, meaning ‘mountain with two tops’. Because of the unique shape of Mount Nijo, it was spontaneous for people at that time to have marked this mountain as the borderline of inner world and outer world. We can find many tumulus of this period till late Nara periodW beyond Mount Nijo, over in the area of Osaka prefecture. 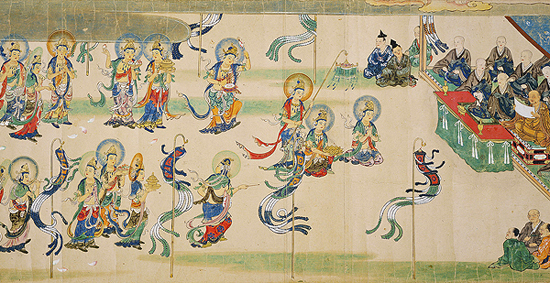 An old painting showing the foudation of Taima-dera. You can see that there are many immortal Buddhas in front of mortal monks. Taima-dera was thought to be founded in 612, first on the land beyond Mount Nijo, later in 681, moved the establishment on the land where it is today because of the oracle that Prince Maroko had in his dream. The land was a belonging to En no GyojaW, the founder of Shugendo who was training there. Here you can see that the land has already been something special. If I were to use the modern description, the land was already a location that was thought to be flowing with mystical energy. The combining of the Buddhism teachings of SukhavatiW, a land of ultimate bliss and the ancient idea of mystical energy should have been strong with the landscape of sunset in between the two tops of Mount Nijo. It is easy to imagine that people thought that the place was the last sanctuary and the gate in between the path of the inner world and the outer world, in other words, this world and the other world. As a sacred gate, the place may had a duty to show and tell what the land of ultimate bliss is like as well as the influence of the teachings of Pure Land BuddhismW spread and became popular in the later years. 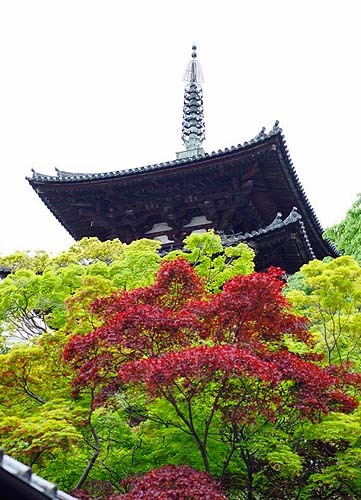 Pagoda of Taima-dera. Photo by (c)Tomo.Yun. I didn’t know much about Taima-dera when I had chance to visit there often to soothe myself by walking around the grounds and sitting in the hall of the temple. But whenever I felt nostalgia in a busy city where I live now, I longed for the place and read some articles or saw some photos at least to calm my feelings. The articles were new to me, leaving me more feelings of nostalgia behind because that I knew the place and as it was a familiar place to me. Still, I cannot deny the reason that attracts me does not only rely on substantial nostalgia but nostalgia that is engraved deep in my soul or in my blood as a Japanese….. There are still many things I’d like to introduce you to this beautiful old temple of Taima which I’ll leave to another day. Take JR Tokai Shinkansen to either Kyoto or Shin-Osaka. Take limited express or express train to ‘Kashihara Jingu-mae‘ from ‘Kyoto’ by Kintetsu Railway. Change train at ‘Kashihara Jingu-mae‘ to semi^express train or local train ‘Abeno-bashi‘. Get off at ‘Taima-dera‘ station. Approx.1 hour on limited express, 1.5 hours on express to ‘ Kashihara Jingu-mae ‘, approx.15 from ‘Kashihara Jingu mae‘ to ‘Taima-dera‘. Take Midosuji line of Osaka metro to ‘Tennoji‘. Walk to the Kintetsu Railway station, ‘Abeno-bashi‘ (only about 200 meters away). Approx.40 minutes from Kintetsu Railway ‘Abeno-bashi’. Address : 1263 Taima, Katsuragi-shi, NARA Pref. **Fee change during 1st Jan, to 6th Jan, 13th Mat to 16th May. Parking : Some private carparks avaliable near the temple.